Last night everyone stayed up past 2 am to help us finish our concrete slab in the workshop. Beginning at about 8 pm, it took five hours, 260 gallons of water, and innumerable shovelfuls of aggregate. Mike and Loree are headed back East soon, and we'll be sad to see them go. Mike's muscle, Loree's pot-roast dinners, and most of all their company will be greatly missed. Thunderstorms have skirted around us for the past few days, coming close enough to spit on us, but they haven't dropped any real rain since the hailstorm that battered Terlingua on the 14th. Temps today will be in the triple digits, so we tried out our new fan mister. Feels great and dropped the room temp by twenty degrees. Ron's pre-fab buildings make moving in easier. Cleverly concealed and incredibly effective battery storage. We spent Thursday running around the county, stopping first at Ron's new storefront on 118. He's selling premade wood buildings for folks who want their shed or cabin to be delivered on-site. Of course, Ron is also our Terlingua solar supplier, so we loaded up with lead for our friend and customer Zoey who has lived off-grid for over a decade now. A couple of eco-nerds in new digs. After swapping the new AGMs for the leaky lead acids, we headed farther south to town and Tonia's fleet of vehicles. We also noted the damage around town after the hailstorm. One person with a weather station logged a 93 mph sustained wind gust, and you should check out our facebook page to see Dan & Jess's video of the flooding and hail. 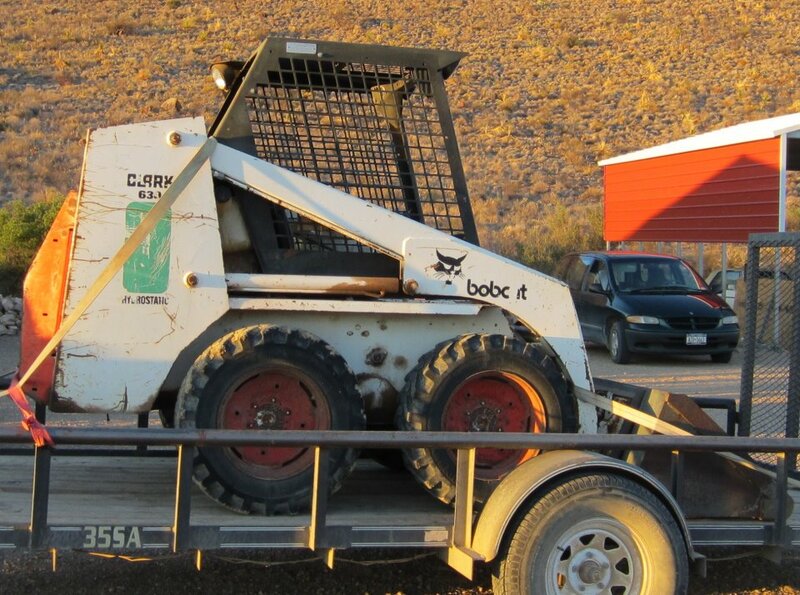 We recently purchased this 30-something-year-old Clark Bobcat 630. It has 2005 hours on the clock, and is in pretty good shape for the age. We plan on refurbishing it over the next few years, but the first thing we need to do is weld a new cutting edge on the bucket. This new piece of equipment will make many of the jobs on our To-Do list happen much faster. From now on, moving gravel will be a breeze. Working on ferro-concreting more of the coop today. Hello everyone out there in the blogger community. We are new to blogger but not new to blogging we have had a blog for about three years Allenergies.net/blog. We recently uploaded our blog content to blogger and so far we have appreciated the Google interface. We recently helped our friends expand their solar power system. They added 1,400 watts of PV to their array, which doubled their power input. Their new panels are mounted to the roof using a prefabricated IronRidge aluminum mounting system. The SunTech PV modules come with a 20 year output warranty and are well matched to the battery bank voltage, which means the OutBack Power MPPT charge controller can operate at peak efficiency. Our friends are happy to now have more electricity than they need, even during times of heavy electrical usage. 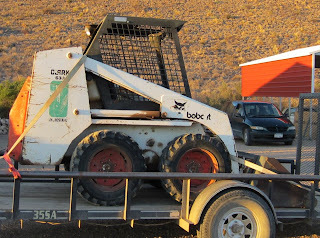 The 1.8 kilowatt SunStation was recently delivered to its new owners on the Terlingua Ranch. The couple is pleased with the performance so far, and are able to run their Airstream travel trailer, including a hefty, roof-mounted air conditioner. Surprisingly, the brand new, modern AC (13k BTU) consumes 1.9 kilowatts per hour. That's about 600 watts more than the similarly sized window unit at my parents' home, which dates to about 1980. We received a large delivery of concrete blocks for some upcoming homestead improvements. 380 8x8x16" blocks, 20 bags of mortar and 20 bags of Portland cement. We are adding a back wall on the shop in blocks up to 7' high, the remainder is framed in steel and covered by steel panels. The floor of the chicken coop was also excavated and poured with homemade concrete this past week. Just a little bit of ferro-cement work on the remaining wall, and our last surviving chicken Foxy Lady (who is doing really well, by the way) will be moving back in. Came across one of these things yesterday. A neighbor was using it in his off-grid home. Apparently the BBC ran some stories about the elderly being scammed with these things over there.